Location: Incognito Hotel is located only 150 m from the sandy beach (3 minutes walk), 200 m from the Sunset Aquapark, in the new part of Pomorie, in the area of ​​Krotiri. The center of Pomorie is 3 km away and the protected area of ​​Pomorie Salt Lake - 2 km. There is a bus stop 800 meters away. Bourgas Airport is a 10-minute drive away. Accommodation: The hotel offers 30 furnished rooms - 16 double standard rooms with shower cabins, 6 studios, 4 double rooms with bathtub, 2 double rooms without balcony, 2 VIP rooms. Rooms are spacious and air-conditioned, with a flat-screen cable TV, a minibar and a balcony. Most bathrooms come with a hydromassage shower. Bars and restaurants: The hotel has a restaurant with 50 seats and a lobby bar. Conference hall: The conference hall has 51 seats and is suitable for conferences, seminars, team buildings, training programs, presentations. 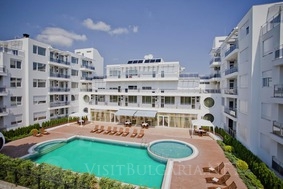 Facilities: Pool with sun loungers, gym, 2 saunas, spa treatments. Children's playground is available for children. The hotel's car park is available at an additional cost. Wi-Fi is available in the hotel area at an extra charge.